Ack! Thpppt!!! is licensed under a Creative Commons Attribution 3.0 Unported License. Permissions beyond the scope of this license may be available. Posted to Flickr on 03 September 2009. Part of the Laugh! series. Funny is fun.™ Included in my Portfolio. 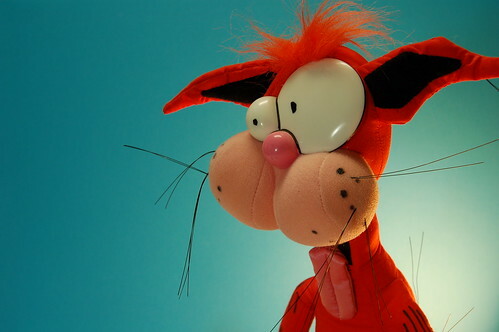 Bill the Cat first appeared in the comic strip Bloom County in the 1980s. He is … well … he’s a bit of a mess, isn’t he? It’s been suggested that at some point his brains were replaced with tater tots. One of Bill’s charming quirks is his oversized eyeball. This image is straight out of the camera: no tweaking, no color processing, no cropping, no nothing. Spotted by Bill the Cat himself in a meta-humorous photo by ShellyS. This photo was posted to Flickr on 03 September 2009. The last time I checked, it had 15,476 views on Flickr. Ack! Thpppt!!! by JD Hancock is licensed under a Creative Commons Attribution 3.0 Unported License. Permissions beyond the scope of this license may be available.